Since John Lennon first wore his famous round glasses, the style has been an ongoing trend. A pair of round eyeglasses has the potential to make any look you sport appear funky and exciting, turning a regular outfit into a super-cool fashion statement.But first you need to choose a pair of retro glasses to suit you. That is where these fun round glasses by grinderPUNCH excel – they are a durable pair of glasses that will spice up any outfit. Read on to find out more about these eyeglasses. 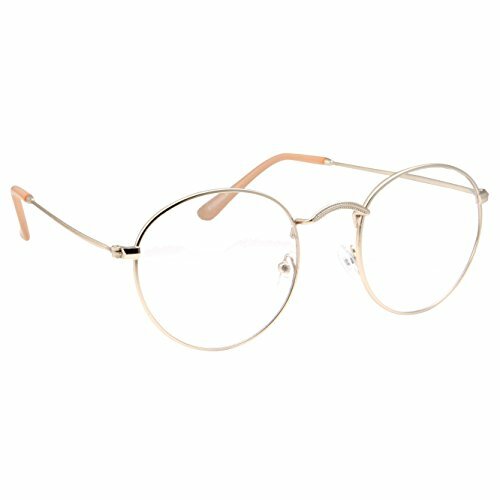 These round, non-prescription metal glasses are great for fashion, especially if you are looking for a pair of glasses that will help you look more retro or intelligent. They are great for dress-up parties too and will quickly become a favorite accessory. These round glasses can be worn by both men and women who are looking for glasses that will shake up their style around the office, while out with friends or at fancy dress parties. These stylish glasses also come with a microfiber storage pouch to keep your glasses safe and scratch-free. The storage pouch also doubles as a soft cleaning cloth to keep your lenses smudge-free and clean. These stylish fashion glasses have a sturdy and durable metal frame and non-polarized plastic lenses that suit most faces. The metal frame allows you to bend the frames closer together if you find that they are too big for your face. The clear, non-prescription lenses are round with a 50-milimeter width and look very retro and appealing – perfect for fashion.Although these glasses are primarily designed to be used for fashion reasons, you can also switch out the plastic lenses for your prescription lenses, making them both stylish and useful. These glasses cost less than $10 (at the time of writing), so they are a real steal if you use them with your prescription lenses. The nose grips can be adjusted so that you can find a comfortable fit based on your face shape. These glasses can be worn by both men and women. There are three frame colors available (pink, black and silver), allowing you to find one that fits you best. Alternatively, you can get all three and choose which one best suits your outfit each day.The grinderPUNCH glasses also boast 100% UVA and UVB protection, ensuring that you can wear these glasses both inside and outside with no issues. These glasses also come with a microfiber storage pouch to keep your glasses safe and scratch-free. These eyeglasses are very easy to use. Just place the arms over your ears and the soft nose pads on the bridge of your nose. They should feel comfortable, almost like they aren’t there at all. These round glasses feature the popular Harry Potter design that has become so prominent in the past two decades. The metal frame has a durable spring hinge that allows you to fit these specs onto your face without any pinching. The screws at the temples allow you to remove the non-polarized plastic lenses and replace them with your own prescription lenses. However, the clear lenses in the frames will not hurt your eyes should you choose to wear them for fashion or costume purposes. The frames come with a lifetime breakage warranty, and the glasses come with a 30-day money back guarantee. Plus, these are very affordable and offer great value for money. After 20 years in the glasses industry, Komehachi are confident in their glasses. These glasses have a sleek and stylish frame that suits most people. They are made from premium metal alloy, making them lightweight yet durable, perfect for everyday wear. The lenses are created from polycarbonate resin, a highly impact-resistant material. These glasses come with anti-scratch coating to keep them safe. The glasses come with a protective case, a soft cleaning cloth, a temple tip, an extra nosepiece, screws and a mini screwdriver. If you want to up your fashion game or impress your friends at the next fancy-dress party, these glasses may be just what you are looking for. Not only do they have a classic style that allows them to be worn while out and about, they look fantastic with funky outfits. Plus, these glasses are very reasonably priced and can be used with your prescription lenses if you like. Thanks to their low price, you can easily buy one in each color so you can choose which suits your daily outfit best. These glasses are a great solution for anyone looking for a fun and exciting pair of glasses that will jazz up their usual style.